Okay, we get it. Sometimes fried food is what you’re called to–probably because it is super tasty and you want to relish every single last bite of it. Even with fried food, there is a way to make it a little bit healthier, if you are so inclined. We really like using an air fryer because it limits the amount of oil that is used while cooking. Even though it uses less oil to cook with, the result is still a crisp fried food take-away…albeit a little lighter. 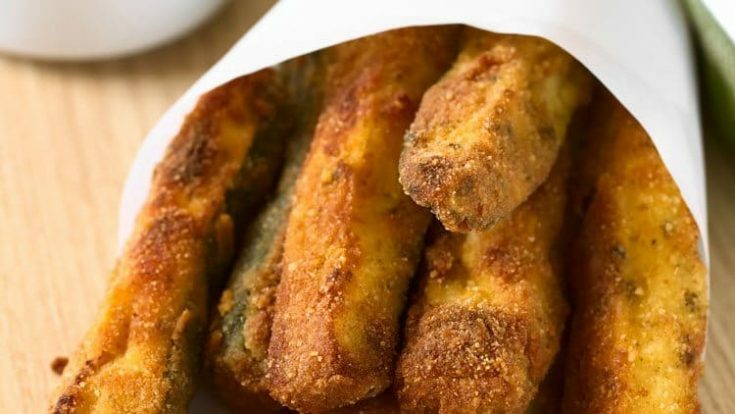 Because we know you LOVE appetizer ideas like fried zucchini sticks, it goes without saying that you’d also love these fun treats: Fried Mozzarella Sticks, Easy Stuffed Mushrooms, and our even lighter Baked Zucchini Sticks. Click Here to get more top-rated restaurant copy cat recipes. 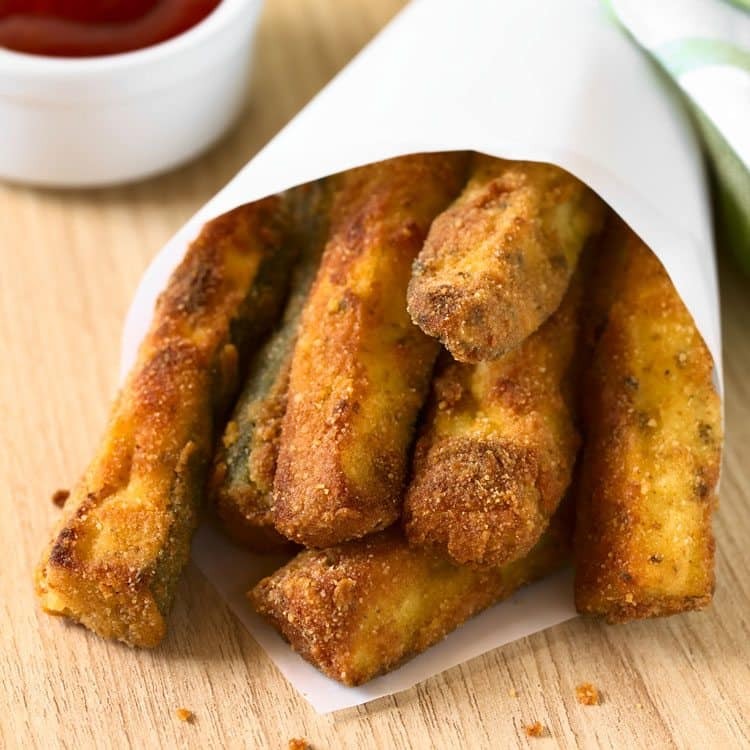 You can make Gluten Free Fried Zucchini Sticks…just substitute the ingredients that have gluten in them for gluten-free ingredients. You might need to order gluten free bread crumbs if they are not available in your local store. As for the zucchini, when it is summer, try growing zucchini in your backyard garden. It’s pretty difficult to mess that crop up. “Zoo sticks” are a long-time favorite appetizer at the Canadian restaurant chain, White Spot. The crispy zucchini sticks are served with cream “zoo dip” and are quite amazing. If you don’t want to deep fry, you can spray the sticks with oil and bake them at 350 F for about 20 minutes, or until golden brown. 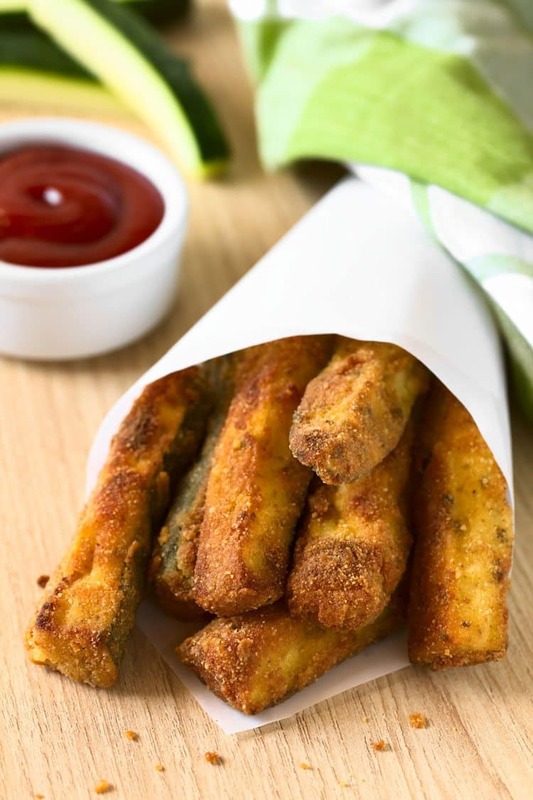 Copycat Zoo Sticks are fried zucchini sticks that are amazingly delicious. This is a fun and easy appetizer recipe. Full of flavor. Coat the zucchini sticks in each shallow dish starting with the flour mixture, then the eggs and finally the bread crumbs. Mix the sour cream and ranch in a small dish and set aside. This will be the dip for your zucchini sticks.